Its official! Skoda Auto India is planning to launch an entry level small car to be priced between Rs. 3 lakh to Rs. 5 lakh by 2013. “We are planning to launch an entry level small car in the price range of Rs. 300,000 to Rs. 500,000 ($6,565-$11,000) by 2013 in India,” Thomas Kuehl, Chief, Sales and marketing, has been quoted as saying by just-auto. Kuhel added that the small car will be available in both petrol and diesel versions. Further, he mentioned that the car will have 70% localization and will be manufactured at the Chakan plant in Pune. The cheapest Skoda model available in India at present is the Fabia which is priced in the range of Rs. 4.44 lakh to Rs. 6.83 lakh (ex-showroom, Delhi). Hence, the new small car will be positioned below Fabia, in the company’s product line up and will be their volume driver. Besides the small car, Skoda is planning to launch the Laura S in August 2011 and a C segment car, the Skoda Rapid (based on Volkswagen Vento) in the first quarter of 2012. We expect the new Laura to come with start-stop technology, parking assist and adaptive cruise control as standard. The price of the next generation Laura would be higher than the current model which has a price range of Rs. 13.52 lakh to Rs. 18.21 lakh (ex-showroom, Delhi). The new Laura will lock horns with cars like the Chevrolet Cruze, Honda Civic, Toyota Corolla and the yet-to-be launched new Volkswagen Jetta. The Rapid will be rolled out during the first quarter of 2012. Earlier, there were speculations that the sedan could be based on the Skoda Fabia or the Vision D concept that the company showcased at the 2011 Geneva Auto Show. However, reliable sources say that it would be based on the Vento and will not have design cues of the Vision D concept or the Fabia. The Skoda Rapid will be powered by the same 1.6 litre petrol and 1.6 litre diesel engines that power the Volkswagen Vento. The 1.6 litre engines (both petrol and diesel) produce 105 PS of maximum power. The engine will likely be mated to a 5-speed manual transmission. Since, Vento is known for its inspiring performance and fuel efficiency, one can expect the Rapid to have similar traits. Talking about Skoda’s sales growth, Kuehl said that Skoda Auto India is growing at the rate of 60% year. The company has sold 6,800 Fabia cars and the total sales of Skoda’s entire product line up stood at 20, 400 units last year. 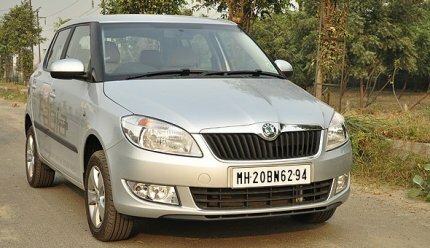 During the first four months of 2011, Skoda Auto sold 10,400 units crossing half of its sales numbers in 2010, thus making a significant progress in Indian car market this year. The launch of new models such as the small car, the new Laura and the Rapid will further increase the Czech brand’s presence in the country.